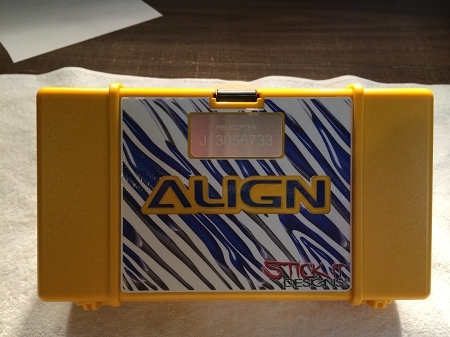 This sticker kit is for the Align starter box. It comes exactly as pictured with the included ALIGN "inlay". The design pictured on the starter box is the BLUE design. 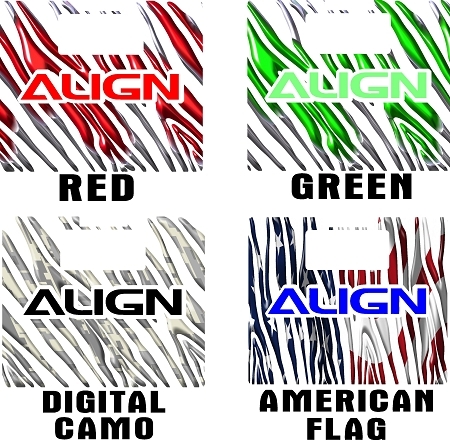 We also offer the RED,GREEN,DIGITAL CAMO and AMERICAN FLAG design. We will ALSO include your pilot name at the bottom of the design at NO extra charge. Just let us know your design of choice and your pilot name (if desired) at the time of checkout in the "comments" box via Paypal. These kits are printed on high performance outdoor vinyl and laminated for superior protection.